send a caravan of missionaries in that part of the vineyard. They might die even there, victims of their zeal”. He was the first Catholic priest to visit Northern Chin State. 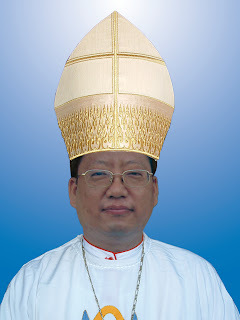 In 1890, the Vicar Apostolic of Mandalay, Msgr. Simon, sent one of his best priests, Fr, Laurent ( MEP ) and Fr. Vestraeten to Chin Hills, 250 miles away. They went towards Northern Chin hills and settled at Balet, south of Mawlaik, on the western side of the Chindwin River. But after one year, they saw that they were still far-from the real Chins. civilized and the life of the priests would be in danger. The Fathers had no choice but to go back to Gangaw. In 1898, the American Baptist missionaries came to Hakha. The same officer who refused to give permission to Catholic missionaries to work in the Chin Hills welcomed them with open arms. governor kindly thanked them for their good works among the Chins but ended his letter by saying that he did not see any reason to forbid the arrival of the Catholics there. “As in the rest of Burma”, he added, “the simultaneous presence of Baptists and Catholics created an emulation quite beneficial to the population, so would the presence of Catholics alongside the Baptists on the hills be of benefit to all people.” With this the Catholics won a landslide victory. The real beginning of the Catholic Church in the Northern Chin hills started with the arrival at Tonzang of Fr. Mainier, Fr. Blivet, Fr. Aloysius U Ba Khin and four catechists: Mg Tun Yin, Fridolinus Mg Ba Maung, Saya Aung Min, Mr. Frank Reuben. Fr. Moses took up his residence at Tonzang, while Fr. Blivet settled at Lailui village.